On November 29, 2018, Dr. 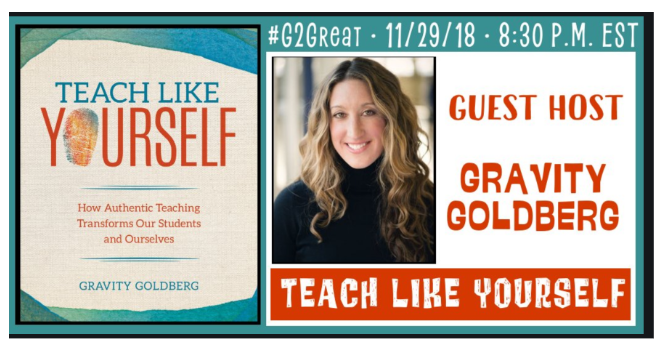 Gravity Goldberg returned to the #G2Great chat table for the third time to discuss her fifth book. 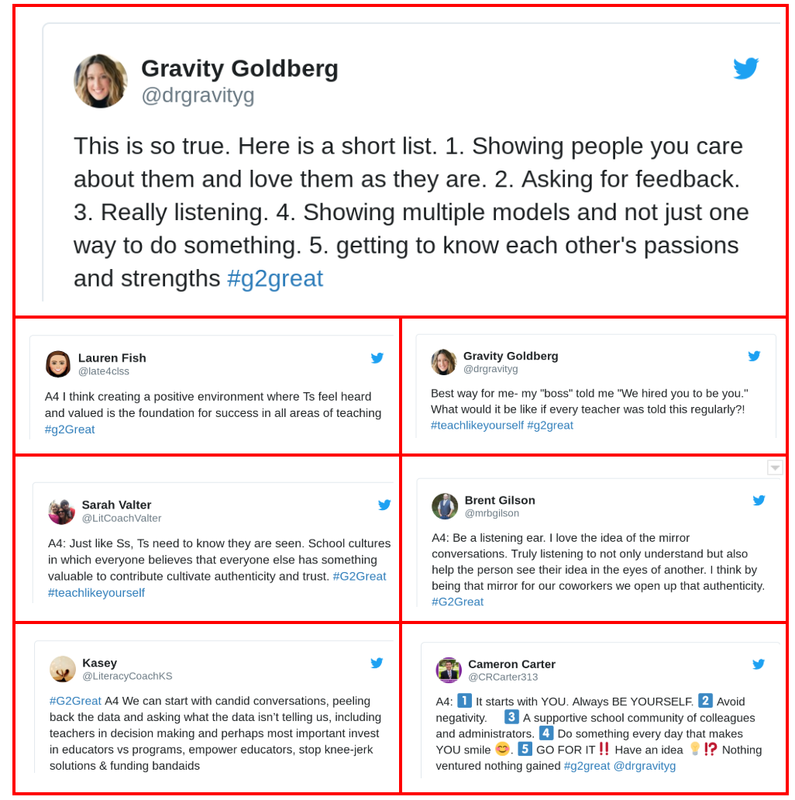 Previously Gravity joined the #G2Great community with her collaborative partner Renee Houser, What Do I Teach Readers Tomorrow? (link) and for Mindset and Moves (link). All of her books have added to our literacy knowledge but this is the book that will be perfect for new teachers, for mentor teachers, for lead teachers, and even experienced teachers who are experiencing some doubt about their current role and purpose in education or even a “personal crisis” in the form of confidence about their teaching life. This book will lift you up and encourage you to build on your inner strengths as well as seek out a community where you will thrive. 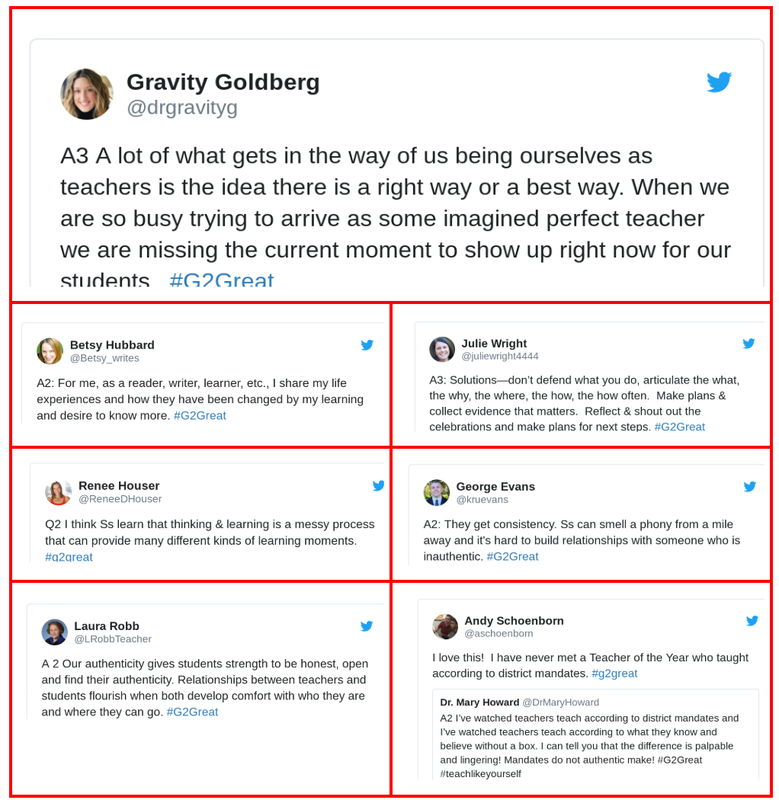 The three quotes below were pre-tweeted out to the Twitterverse and the #G2Great community as “Words of Wisdom” in the hour before chat and opened up the topic of #TeachLikeYourself as both a singular and collaborative effort. And that focus remained for the entire chat. Sometimes we discussed individual teacher roles and sometimes we discussed the collaborative product of the efforts put forth by a group of teachers determined to provide quality learning experiences for all students. And we were off with this opening quote from Gravity’s new book that listed three key ingredients that teachers need: a deep sense of self, confidence and freedom. What does a deep sense of authenticity or self entail? A deep sense of authenticity or self means that you, the teacher, know yourself. Your real self shows up to teach. The self that interacts with students, parents, community and staff day after day. The teaching self that is “you”. The you that is focused on the students in front of you who are learning every day just as you are also learning side by side with them. Responsibility for learning rests with the individual teacher and the daily work in the classroom. As a group, we can be genuinely curious about our students. We can also build on students’ strengths and share our successes. And we can also share what has been successful for our teaching challenges in order to “share the love” for what works when we have high expectations. We will remind each other that FAIL means “First Attempt in Learning” and we will get up and try again when our work misses the mark. Having a thought partner will make this journey toward authenticity easier! What is “confidence” in our practice? You have “confidence” in your practice when you use something that has had proven success before. It doesn’t mean that you become a “robot” or immediately “adopt” someone else’s work/beliefs, but it does mean that you will seek out additional ideas if something is not working. You will exhaust all avenues in order to go “the extra mile” for your students. When we have confidence in our practice, we can face the barriers and stand strong. The barriers are many so we appreciate having a community to stand with, beside, and around us! Internal barriers include self-doubt, comparisons to others, worry, stress and pressure when students don’t make the progress expected. External barriers include: common pacing guides, common assessments, lack of time, limited classroom libraries, mandates that are contrary to beliefs and values, and many more listed in the wakelet. 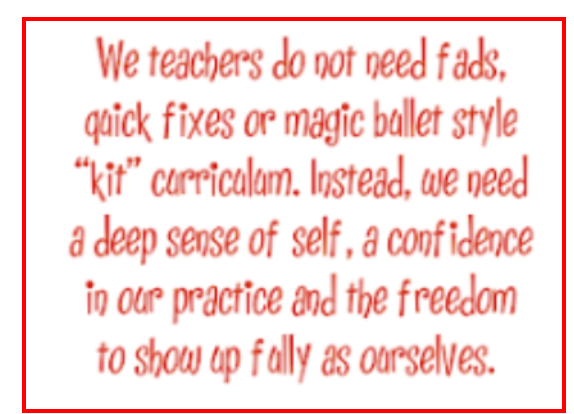 Teachers who have confidence in their practice rise above those barriers and retain their authenticity as well as flourish in the knowledge that students are successful learners! When do we have the freedom to show up fully as ourselves? When we feel supported or work in a supportive environment – team, grade level, building or district that is supportive – we have the freedom to show up fully as ourselves. That does mean that we need to take the initiative and be clear about our needs as well as then name when those needs are met in order to enable others to show up fully as themselves. We intentionally and purposefully manage our own self-care daily as well as make sure that we are not impeding others’ path to their own self-care. Sometimes it means that we have to step out of our comfort zone to help others. The professional relationships that we build and nurture may be in our building or they may be in a different part of our state or even in a distant state. Valuing other ways to connect with individuals is a skill that we can nurture for ourselves as well as help students see the value in connecting with individuals in other locations. Professional learning then becomes about sharing what we have learned as well as what we need to learn and then growing collectively to share ways to continue to grow our knowledge and skills. The solutions lie within the teachers in every classroom in every building in every district in every state/country. Driven to continue learning, to be the best teacher, to be authentic, and to grow every day – those are characteristics of teachers who are being their “best” teacher every day. If you are having a challenging day, stop and think . . . are you out of balance? RE-center your deep sense of self, your confidence in your teaching, and your freedom to show up freely as yourself. Can you do this by yourself? Who will you ask to help? Get clear on your what. When do you have the freedom to show up freely as yourself? 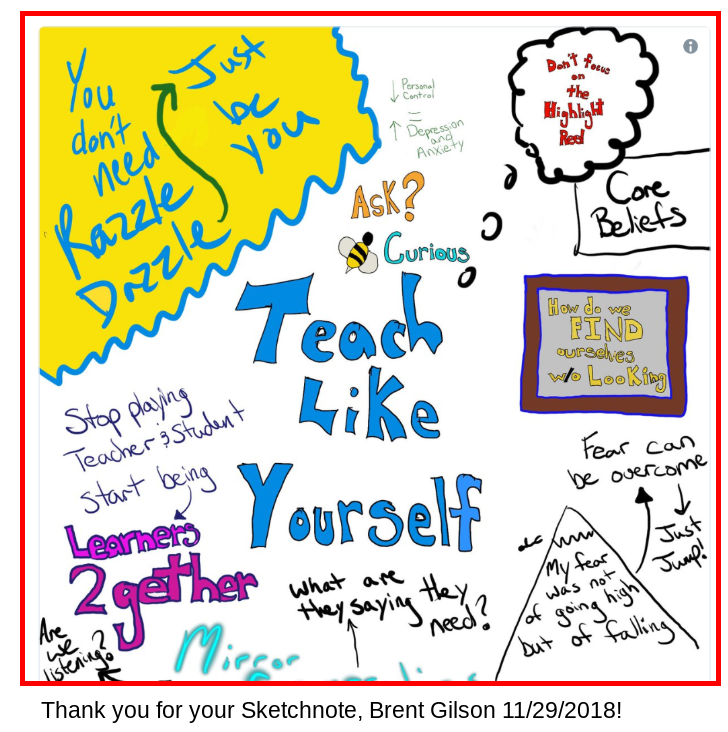 Are the ideas in the sketchnote some that you heard in the chat? 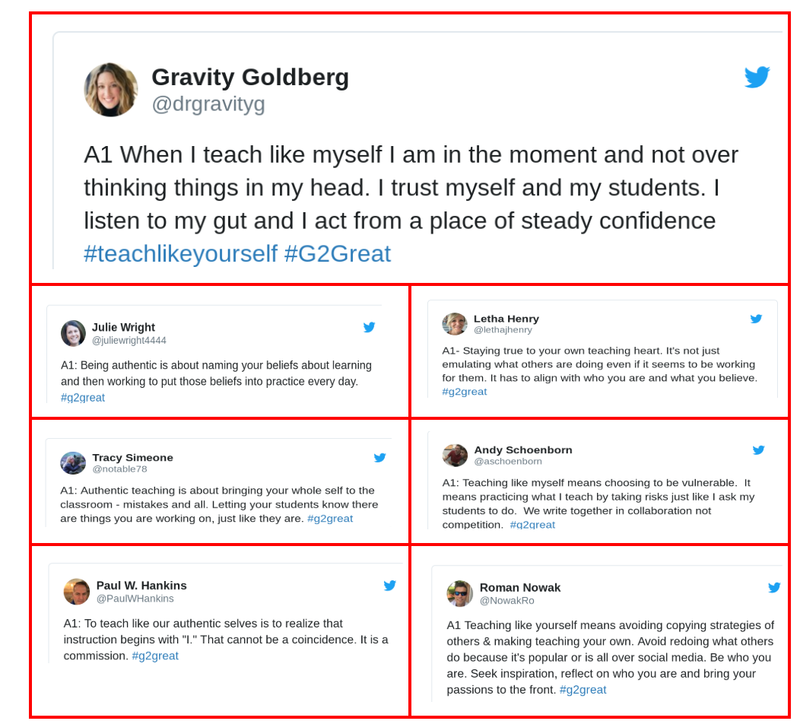 Check out these resources for more ideas about being your true authentic teacher self! Gravity Goldberg and Renee Houser What Do I Teach Readers Tomorrow?